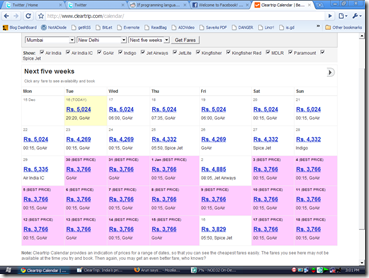 UI is totally ignored in most indian sites including our railways portal! With the many payment options available at ClearTrip, it won’t be any difficult to get your travel planned and confirmed. Yes. 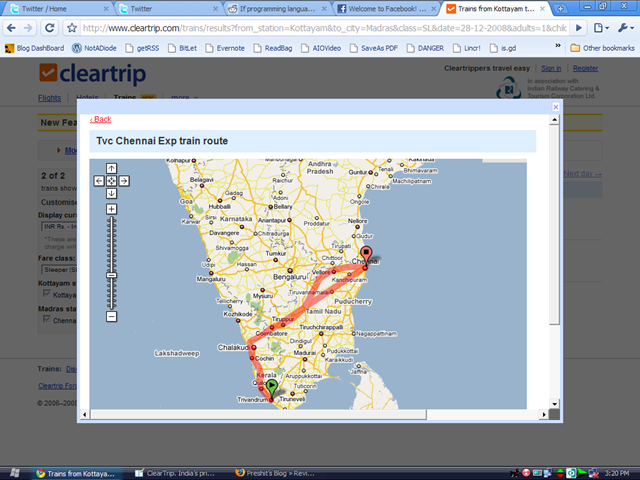 Unfortunately, our railway portal is one among the worst designed portals on web ! I wonder why they aren’t designing it properly, even though they’ve got the funds to do it. Yes. Many are a bucket of colours. 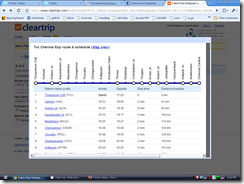 But, there are many more like ClearTrip, which are the gems among design and usability. You wrote this post after BCK..? Did you win the prize..? And btw, what did you do with the 25$ cash you won recently..? 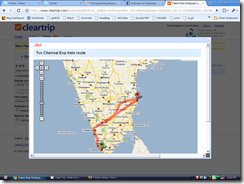 What I meant was, did Clear Trip sponsor our blog Camp..? Had you written this review earlier..? This has got nothing to do with sponsorships. 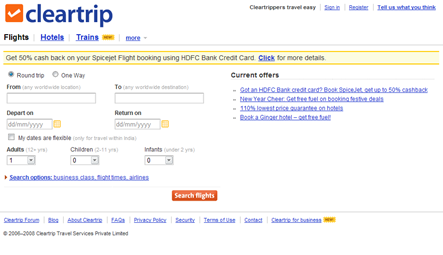 Morover, ClearTrip wasn’t a sponsor of BCK, either. Also, this is not a paid review, or anything of that sort. I wrote about ClearTrip, because, they’ve done a superb work and I stand for spreading good works and goodness ! I see you are going great with MillionClues. Go ahead. All the best wishes and support assured. Hey, Thanks for the assurance, That really helps man. Did you see the friends page..? What a way to make your friends feel special. Lovable page there, Arun. Wonderful. Hmm, I am glad that you enjoyed my page, Why dont you make one such page..? Mani’s idea is great. You will be there for BCK 4.. right..? Clear trip is definitely a great service when coming to train tickets, but regarding flight tickets I’m not sure if its the best one. I searched for flights from Mangalore to Kochi and it showed 5100 for 2 people, but at the same time KF was showing 4700 for the same ticket same day. 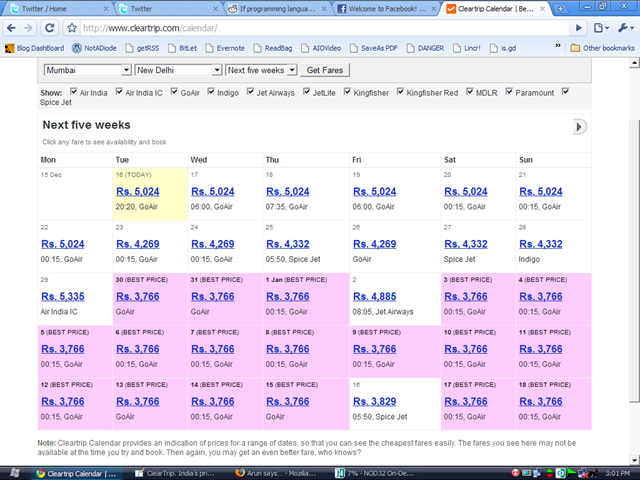 Think twice before you book tickets thru cleartrip. The site is very user friendly but that alone does not help. The after sales service, viz for cancellation, rescheduling..is very disappoiting. Have a look at their complains link. if you are someone to take a risk of loosing some money, go ahead. By the way, there are other service providers who offers better price and service. I value your opinion. I personally haven’t used them to book tickets. I was focussing solely on the Interface and design. I second Augustine and have personlly experienced it. 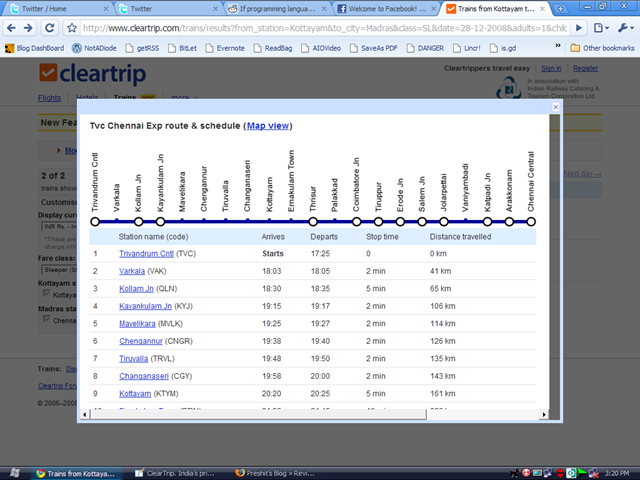 Website is good but if you happen to fall in hands of customer services for cleartrip.. they will make sure to take you for a trip. REAL BAD. Oh, that’s sad. Haven’t used them yet. Wow. Congrats ClearTrip.com! You have done so good in business and establish a good name to make it to the top of all indian online travel agent. Welcome to cultural state Orissa – the east state of India.Orissa, the land of Historical, is one of the most sought after tourist destinations in India. Completely soaked into royal grand. The site is very user friendly but that alone does not help. The after sales service, viz for cancellation, rescheduling is very disappointing. Thank you. The site is very user friendly but that alone does not help. Clear trip is definitely a great service when coming to train tickets, but regarding flight tickets I’m not sure if its the best one. Thank you.